Wide-format printers will break down without regular maintenance. Here are some tips to keep your printers running longer. Nearly everyone has a car and understands the need for regular service. But many are shocked when their printer breaks down after three to four years and millions of cycles, when they have never once performed any maintenance on the unit. This article originally appeared in SGIA Journal's September/October 2016 issue. Yes, that was almost 20 years ago, and modern inks don’t fade nearly as much as they used to, but the maxim still stands — your printers will break. There is, however, quite a bit you can do to help yourself and your printer. Nearly everyone has a car and understands the need for regular service including oil and filter changes, brakes, tires, etc. But many are shocked when their printer breaks down after three to four years and millions of cycles, when they have never once performed any maintenance or had any service on the unit — even though these same people religiously service their vehicles. No different than your car or truck, your printer is a man-made mechanical device with parts made of metal and plastic that will break over time. They run for thousands of hours and make hundreds of thousands of repetitive motions back and forth, not to mention your printheads measuring shots in the billions. Put all those numbers together with a general lack of care and maintenance, which is what we see all too often, and you have a recipe for disaster. So what can you do to help out your printer, and also yourself? Let’s break it down into a few categories. Most manufacturer’s data sheets show an operating range for temperature at perhaps 65-85 degrees. You should be somewhere in the middle, and 75 degrees is a good number for most all print technologies. What about humidity? Though most manufacturers don’t specify, you need your inks to dry — the number there is around 40-60%, with 50% being a good target. 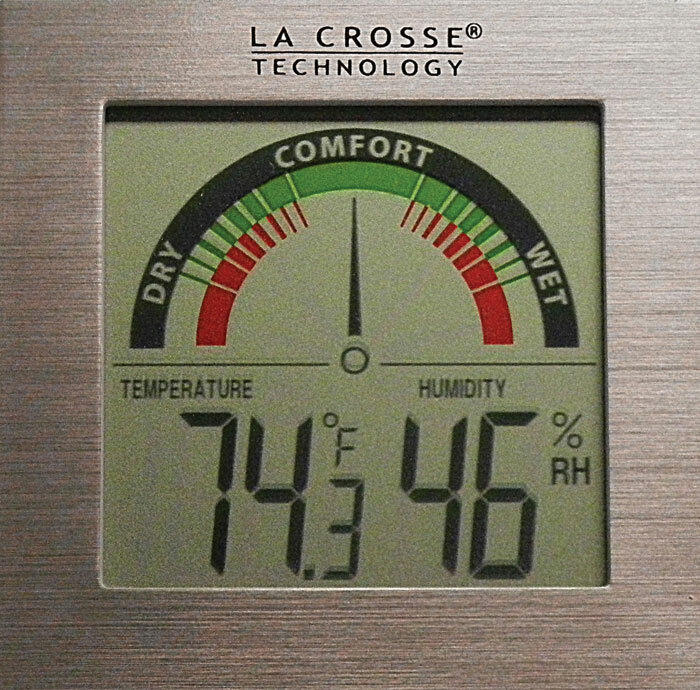 Buy a hygrometer and put it in your shop to measure your humidity. (See figure 1.) A decent one with a thermometer is usually $20 or less. Too much humidity and your inks may not dry properly, plus paper liners on vinyls may absorb humidity and cockle, causing printing issues and head strikes. Too little humidity and you may have static issues, which may lead to overspray or other printing problems, including data inaccuracies that will cause your printer to produce bad prints. Temperature and humidity fall into the “Goldilocks Zone” — there is too much or too little, and then there is just right. Dye sublimation printing in particular is especially susceptible to humidity and temperature variations. If it’s too humid, get a dehumidifier; if it’s too dry, get a humidifier. Keep in mind that these products are not a one-off solution; a lot depends on your room size, ventilation, HVAC system, etc. Do some research or call in a professional for some ideas. Properly maintaining your environment also includes not turning your shop down to 50 degrees on long winter weekends. In that case, the entire print mechanism, including the print heaters and printheads, have to warm up before printing the next time, and cold media will not be properly ink receptive, either. On a shop visit, I once waited 35 minutes just for a test print as the guys were running around in jackets in a 60-degree shop. Keep in mind that humidity and temperature can affect your color — slower drying ink may encourage more dot gain (think of pressing a marker on paper and watching the ink spread — that is dot gain). Faster drying conditions will encourage less dot gain and allow less than normal mixing of inks on the substrate, and you may see more print banding under those conditions. Again, Goldilocks rules. Of course, all the individual printer makes and models have variations in their systems and sub-systems, though there are common systems that most (if not all) of them have. Though their names and the error messages that come up when failures occur may vary, the following are the areas you can look for in virtually all printer models that may have problems from time to time. Filters and Fans: Most printers have fans and filters to keep them cool, especially UV printers on the lamp housings. Keep them clean and replace them if even remotely suspect — they are far cheaper than any repairs relating to them. If you are in a dusty environment, check the filters often and replace, even more often than you think they may need. Take some shop air or canned air and blow out the fans — you will be amazed how much dust can accumulate there. Rails and Carriage: Wipe the printer’s carriage rail with a soft cloth and follow the manufacturer’s recommendations to know which lubricant to use. We see a lot of carriage motion or Y-current errors, many of which disappear when the carriage is cleaned and oiled. Older latex printers have a felt pad plus a carriage rail belt and tensioner, plus bushings that need replacement after a couple of years, especially with all the heat under the hood on those units. Encoder System: The printer’s encoder system primarily consists of two parts — the encoder strip itself and the encoder sensor. The strip is basically a clear ruler with many small marks on it, and may be found stretching side to side on the printer. It is usually right on the rail on some of the common solvent printers. The sensor has an electric eye and receptor — it straddles the strip and reads the marks so the printer knows its position. If it can’t read the strip because it’s dirty or damaged, or if the sensor is clouded after years of use, you may get a variety of errors depending on the brand and model of printer. Clean the strip gently with isopropyl alcohol, and blow the sensor out with some shop air to clear the dust. If you ever need to replace the strip, replace the sensor too — they are fairly inexpensive. Think of it simply as the oil filter with the oil change in your car. Keep in mind that larger printers may have a carriage encoder, such as a UV printer where the carriage is raised and lowered over longer distances than a smaller solvent or latex printer. The same cleaning and service rules apply here as well. Heaters: Depending on the printer type and model, most have some type of heating system — substrate pre-, print- and post-heaters, drying and curing heaters, etc. For the most part, not a whole lot can be done to prevent failures, but some have cooling fans that operate to cool the heaters between cycles. Use shop air to blow out the air intakes and heating surfaces. Printhead and Ink Systems: This is generally the most sensitive and often the most expensive area when it comes to printer repairs. I can think back to the early days when the only printers out there had replaceable cartridges. Lo and behold, a printer with “permanent” printheads came along. Well, permanent wasn’t really permanent, and we now find “shot counts” measured in the billions to give us an idea of the use and remaining life on these printheads. Though on many popular types the general school of thought is that they should last around 5 billion, we have seen some go out in the mid-3 billion range and some still printing strong over 10 billion. For solvent printers, the area of the printhead and cap have a greater opportunity for abuse, damage or neglect than any other area of the printer. First and foremost, keep the area of the cap and where it contacts the printhead scrupulously clean. A dirty cap or printhead won’t seal well, meaning the pump won’t draw well and prime the head, and it all goes downhill from there. Use your solvent maintenance fluid with a lint-free, solvent-capable swab (not Q-tips) to gently wipe around the edges of the head and cap to remove all dried and crusted ink. If you are getting nozzle dropout, you can soak your printheads on a lint-free cloth soaked with maintenance fluid. Clean any crusted ink out of the cap and occasionally let some fluid run through the cap into the waste bottle. Like your car, your printer runs best with clean fluids in it. Latex printers use one of two technologies: snap-in, user-replaceable printheads, or “permanent” printheads similar to solvent printers. One of the good things about the snap-in variety is they are largely self-maintaining, hence “maintenance-free,” but there are still a few things you can and should do. Those with permanent-style printheads will need care similar to solvent printers. UV Printers not only have a carriage rail for the printheads, but they often have a rail for the head carriage itself so it can raise and lower to adjust for different substrate thicknesses — plus there is an encoder strip and sensor for that. Capping systems vary for these and some have none, but find the manufacturer’s suggestions for capping/cleaning/protecting your print­heads — that’s where the money is when it comes to repairs. The big thing on all printer types — if you see a warning message, pay attention, and at the very least ask an experienced technician what if any service is truly needed. I have given you many “do’s” — the things you can and should do yourself. Let’s talk about the “don’ts,” or things you should probably not do. Our number one don’t would be removing printheads. The famous football coach Woody Hayes hated passing the football, and said that “only three things could happen, and two of them are bad.” The same applies to printheads, but there are more than two things that can go bad. You could scratch them, allow them to dry out, damage them internally by forcing fluid, or fail to reconnect them properly with disastrous electrical consequences for your printer. Unless you know what you are doing, leave printhead service to the professionals. Take a look at what one of our customers did to his printhead cable. He “fried” his main board and many other components himself, a repair that cost him around $5,000. Unless you are a mechanical marvel, leave the mechanics alone as well. While there are many videos and self-help guides on the internet, many of these make even the most difficult jobs look easy. Our technician’s worst nightmare is walking in to find the proverbial bucket of bolts on the floor next to the printer. The good news is that, like taking care of your car, proper care as you go along can prevent a host of problems and save you a lot of money. There are things you can do and should do, but leave the delicate stuff to the professionals. A 25+ year industry veteran, Bob Flipse was an early innovator in wide-format digital printing. Starting in aqueous, his knowledge now covers solvent, UV and other ink technologies. Bob is currently a partner in GrafxNetwork, a nationwide service company for wide-format printing equipment.